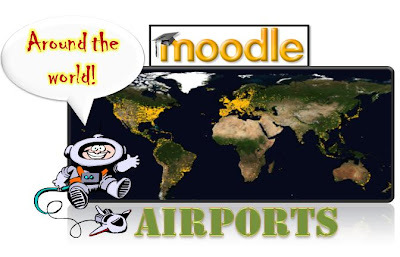 ZaidLearn: Moodle is an Airport, Not a Total Solution! Moodle is an Airport, Not a Total Solution! No, it is not an Airport! It is more like a space station! If you ask a true learning professional, he or she will probably articulate Moodle as a virtual learning environment (VLE), or course management system (CMS), or worst case a learning management system (LMS). Whatever Moodle is, in this post Moodle is an 'Airport' (figurative speech that is!). However, I am not going to spend the rest of this post proving the 'Airport' theory, but I will share some of my experiences and ideas on how we can get the best from Moodle, and not fall into the pitfalls (that I have faced over the years). As for the 'Airport' visualization, I will leave that to your creative imagination of reading between the lines. Let's begin! A total online campus management solution for your University. If you are planning to use Moodle as a total online learning solution covering everything from online course registration, semester results generation, intelligent class scheduling, to alumni management, you are going struggle no matter how many Moodle plug-ins you discover and use. Instead, explore using other online tools out there (or perhaps let your team develop the tools necessary), which can be integrated with Moodle providing all the needs your online campus management system requires. An excellent content development tool. In a nutshell, use it for uploading, managing and tracking your content, but please use other web 2.0 or rapid e-learning development tools to develop engaging and inspiring multimedia learning content. Although, you can create some simple web-pages, a crappy online book, who-ha podcasts, and a few other stuff using 3rd party Moodle plug-ins, many other content development tools out there can do a much better job than Moodle. No question about that! Since Moodle supports ZIP file upload and the SCORM mambo-jumbo, your options are pretty good to use practically any content development tool out there. A concurrent users' king! I have felt it, and I have heard from every corner of the world that Moodle increasingly becomes a pain when the concurrent users size increases (say 60 or more!). I have heard and read that people have solved this problem, but again and again the number one complaint about Moodle is that they struggle to deal with scalability and large concurrent user sessions (e.g. 200 students doing online quiz at the same time). So, what is the problem? Is it the CPU or RAM specs issue, perhaps its' the network, database, or even a combination of things mentioned, or what? Click here for a white paper (PDF) from Moodlerooms to help you deal with it. But, Moodle should really simplify and be creative about informing and guiding Moodle administrators on how to deal with the concurrent users issue. If there was a wizard embedded in Moodle dealing with this issue, I would be really happy. Any other suggestions? A web 2.0 sensation. I suppose Moodle 2.0 will be pretty good, but let's face it, purpose-built web 2.0 alternatives (e.g. Wikispaces) are worth considering before you get lost in Moodle's crappy blogging, wiki, etc. tools. They are usable, but no match for the real deals out there. Click here, to get some saucy tips on whether to use Moodle's embedded Web 2.0 tools, or go for the purpose-built web 2.0 alternatives. Yes, you might want to also check out Jane Hart's amazing list of +3000 potential learning tools to facilitate your learning environment. Finally, ZaidLearn's filtered down learning tools list, might be a good starting point. In short, Moodle is an Airport, not a total solution! Although, Moodle sounds quite bad until now (in this post), it is certainly better than most other Virtual Learning Environment (VLE) tools that I have tried over the years. If you need a tool to facilitate your online course and learning environment, Blackboard is certainly out, unless they have dramatically improved since the last time I tried it (2008). Anyway, Blackboard is a commercial tool, and you certainly don't want to get into a mess spending tons of money, getting confused with all their product options, and finally ending up buying exactly what you don't need. A-Z, Blackboard is not my cup of VLE. Sakai with its Java code and messy interface is out (unless I got some Java dudes to mess it up further! ), no matter how many features they have. Angel? Looked at it once, and that is it. There are tons of other VLE tools you might want to explore, so perhaps you should use EduTools to assist you to get the right alternative or combination that meets your unique learning requirements and needs. EduTools is a pretty good free course management system comparison and selection tool to use, compared to the commercial alternatives that Brandon Hall and Bersin provide (last resort, if EduTools fails!). If you are looking for a free hosted VLE (or LMS) alternative, CLICK HERE! If you are conducting your own little programs or courses, then a free hosted VLE might be worthwhile, but I would not recommend Universities or Colleges to adopt such tools on a large scale, because of the what-if scenario (collapses, becomes commercial, system failure, New Pro-version, etc). Though, no matter how frustrated I have been with Moodle over the years, compared to other VLE tools, Moodle simply rocks (based on my experiences). So, what is so special about Moodle? First, the Moodle community is worldwide and nearly as fanatical as the Apple mafia. You will find fanatical Moodle fans and support (including excellent documentation and facilitation tips) wherever you practically go in the world, and that is really a major plus. And often the greatest fans, are actually the educators themselves. Ironically, educators are often the ones that make the most noise when it comes to using other VLE tools (e.g. Blackboard). I believe the main reason, is that Moodle is easy-to-learn, easy-to-teach, easy-to-build and easy-to-use. Also, its embedded constructivist learning framework, and excellent set of basic learning tools are really powerful reasons for using Moodle. Developing quiz questions in Notepad and reviewing the results using the 'Item Analysis' tool. All your learning activities and events (if added) is directly visible and automatically linkable from the calendar, making it easier to see how active your upcoming week or month will be. Once I used the Glossary tool to develop a search engine, which enabled users easily to search 100+ Courseware down to the topic level (Now, you might instead want to use Google Custom Search). It also allows people to comment and suggest entries, and even configure your glossary to become FAQs, Encyclopedia, Entry List, etc. Not bad! It generates complete and summarized reports on the students' progress, results, and utilization of Moodle. Although, it is not perfect, it gives you quickly an idea of students usage patterns, and whether they are really trying or not. The same applies to educators, too. Yeah, administrators can easily find out, whether the educators are really trying or not to explore Moodle. I have experienced educators who complain about using Moodle, without ever logging in. It allows you to customize your rubrics (Scales), comments and rating scales features for many of the Moodle tools, including Workshop, Forum and Glossary. To facilitate deep learning you got to include a lot of reflection, peer-learning and (role) modeling, and Moodle has that intuitively embedded in many places (without many really realizing it!). Besides these five basic giants above, the forum, questionnaire and assignment tools are also really useful and powerful. Also, it is really easy to customize, design, and restructure courses in Moodle to meet our basic learning needs. Some educators get the thrill out of making their course homepage more attractive with some mind stimulating images. Moodle courses only show what lecturers are using, so you don't get all those juicy buttons (e.g. quiz) that are totally empty when clicked. You can structure course content and activities according to the course outline, making it super easy for students to zoom in on what they want. Yes, you can edit, delete or move the course resources and activities straight from the course page, without needing to go to another webpage. Just click 'Turn Editing on'. But I suppose what really makes Moodle super juicy and the defacto VLE, is that it can easily be integrated with so many other types of relevant learning tools, which include web-conferencing tools (e.g. DimDim), learning activity management system (e.g. LAMS), anti-plagiarism software (e.g. TurnItIn), 3D virtual worlds (e.g. Sloodle), and much more. As Moodle is used by millions of people around the world, you will find many really cool web 2.0 learning tools that have developed integration modules for Moodle (which makes totally sense). However, how you implement Moodle depends a lot on your needs, requirements, available resources, and importantly who will actually be using it. So, tailoring your 'Moodle Airport' requires you to re-examine the learning context and sufficient human/financial/technical resources at your disposal. It is tough, but with Moodle you have many unique and valuable possibilities. So, are you now realizing why Moodle is really an Airport, and not a total learning solution. If you ask me, Moodle is a good meeting place (airport or space station), or a starting point where we get together to discuss and share ideas, before taking off using both inbuilt and integrated learning tools to experience engaging and enriching learning adventures beyond any single VLE can provide. But then Joseph Thibault (in the comments section) crushes my Airport analogy, by saying, "...that "starting point" is probably the best. It's like a hub, where teachers can tie in all their other resources (and track their students use of them). That's the real value." First, I was crushed by this valuable reflection, but then I was inspired to synthesize this latest reflection of the Airport analogy, into the "Airport-Hub" analogy. Lovely! Finally, I have come to realize that the more I use Moodle (although increasingly discovering weaknesses and areas to improve), the more I love it, the more I want to use it, and importantly the more I want to promote it to educators and people around the world. Hey great post! I like the airport analogy, but would say that "starting point" is probably the best. It's like a hub, where teachers can tie in all their other resources (and track their students use of them). That's the real value. Also, I LOVE the ability to create quizzes using a text editor. Seriously one of the best options available and it probably should be built into every future LMS/VLE designed. Period. Nice job here in providing overview of pros and cons of using Moodle. I agree with about 80%. You did not mention--A lot does depends on context. Don't forget many small organizations only want to author in one tool. Not everyone has the resources to pick the best software solution for each learning activity. The questionaire module is great! I have embedded some of your juicy comments in the post. WOW, I got 80%, which is something like a B+. Not bad! I agree with your context thingy, but not on the Moodle one authoring stuff. Give it a try and Cheers! Good overview of Moodle, with so many angles i did not know of. Thanks again. Great stuff for a new post. I thoroughly enjoyed reading this post. It is very refreshing to have somebody with a deep knowledge of Moodle give such an "outsider" perspective. I would say that your post is full of good advice to anybody starting the Moodle journey. Many of your points should be on the community's radar (I am sure they are!). A free, web-hosted alternative to Moodle is EDU2.0 (http://www.edu20.org). It has a similar set of features but is much easier to user. It currently has over 100,000 members and is growing by 100% every 6 months. Thanks for the Moodle Buzz. It is my first Moodle Buzz, so I am pretty happy about that! Thanks for sharing the security flaw, and hopefully the Moodle mafia can deal with it in a efficient and effective way. I am sure there other security lapses, too. Thank you ZAid! Allways interesting... Moodle rocks, but but but... You are right! I like this analogy of the airport. I came across you via Stephen Downes' post. You've put together a really balanced view on what Moodle is and isn't good for. I agree entirely that Moodle is "easy-to-learn, easy-to-teach, easy-to-build and easy-to-use". But, as you say, it doesn't do everything! Thanks for your feedback and for pointing out that the concurrent user point is weak. Although, Moodlerooms claims the moon, I know for sure that basically every University in Malaysia that has adopted Moodle (many!) has struggled or is struggling with scalability, especially the concurrent users issue. Also, I have got feedback from Saudi Arabia, Singapore, Canada, England and several other places, which face the same problem, or has faced it. It can be done, but how many has succeeded? Currently, that is the only problem we are facing at our University, too. Though, now we are buying bigger server(s), and hopefully it can handle 200-300 concurrent users doing for example online quiz, but it won't be ball in the park. In short, Moodle could solve this problem, by making it more friendly to configure and optimize the concurrent capacity. There are two issues being conflated here. Application scalability and the ability of system administrators to scale their systems. As you pointed out, Moodle scales (http://moodle.org/sites/ & http://docs.moodle.org/en/Large_installations). I do feel your need for more "help" from Moodle. If you search for Moodle server sizing guide on Google, you'll find my 2004 posting on top. There is some free help at (http://docs.moodle.org/en/Performance) and paid help at Moodle partners (http://moodle.com/partners/). Thanks for the constructive feedback and links. I will make sure my team scrutinize them (Hopefully they have already). First, of all perhaps Moodle should optimize the coding and database management (wizard or monitoring tool taking care of everything), like intelligently making it consume less RAM and processing. For example, now the rule of thumb is 50 concurrent users for 1GB RAM. However, most Universities I have communicated with have problems above 70 concurrent users (e.g. doing online quiz) with 8GB RAM dedicated servers. So, there are other issues that many administrators don't know how to deal with. If managing the concurrent issue was as easy as using Moodle for academics, the world of the administrator would be great. Which web conferencing software do you recommend? Scalability, particularly in terms of concurrent users is, and has for a very long time, been a huge Moodle problem. Testing and chat are two of the large problems for Moodle in this area and two problems that isn't even being considered in the release billed to "solve all Moodle problems". Do you see this problem addressed here? Moodle, in a way, has modified the way knowledge was recognized in the past. It is developed in such a way that it can encourage the educators to increase their strategies and make online learning innovative and uncomplicated.